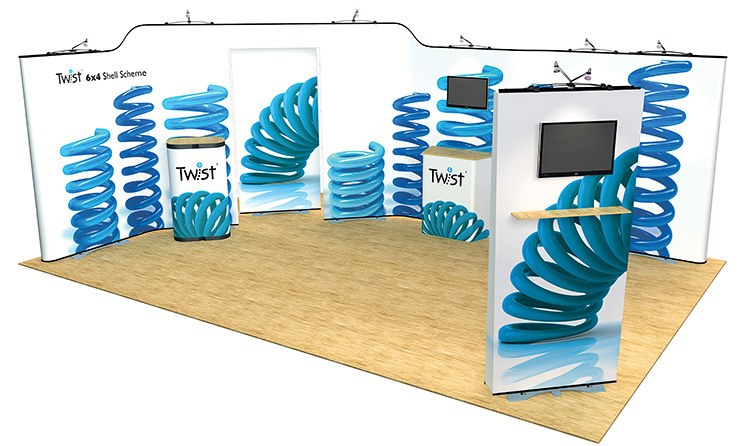 We are an official Eve Twist® Banner Stand dealer and we stock the complete range of Twist® exhibition stand products. 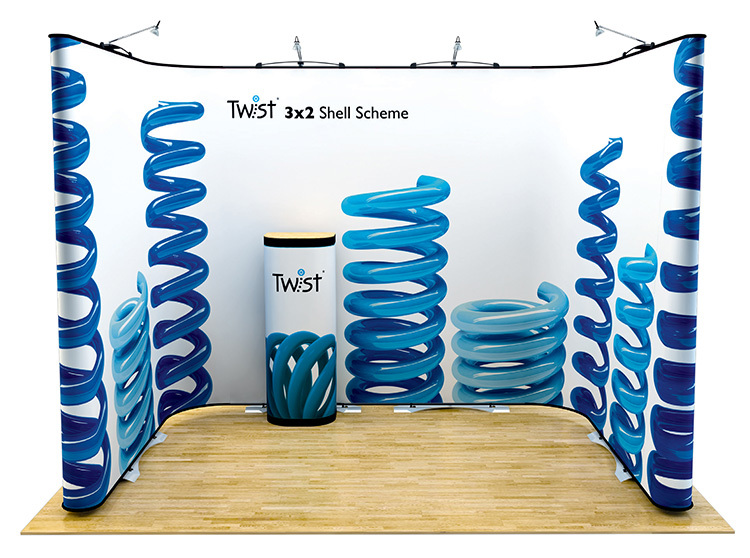 The Twist system is a truly eye catching large format, exhibition backdrop and shell scheme system that is not only portable but offers the flexibility to grow with your business and display marketing needs. The Twist banner offers many benefits for your business from a single banner through to a large modular exhibition stand. This range has been designed and manufactured in the UK and is proving to be one of the most flexible, portable, modular display stands available in the exhibition industry. Twist banner stands are undoubtedly one of the best portable display solutions for when you need to create a large versatile and flexible exhibition display that can be configured and re-configured to fit any exhibition stand space. The system includes singular banner stands available in either 700mm, 800mm, 900mm and 1000mm widths and 2000mm, 2250mm and 2700mm heights. Additional units along with flexi link kits can be joined together which enables your large display to bend and flex without compromising a seamless high impact visual. Read more to see what the Twist can do for your business. The Twist banner system compromises modular components each with the capability of being linked and joined together to create a flexible exhibition stand. Twist Original Banner Stand is a sleek and versatile banner stand which can be used as a singular banner or linked with other Twist banners to create a large bespoke exhibition stand. It is available in 3 widths and 3 different heights. The Twist Media is the same as the Twist Original with the same sleek modern design but with the added benefit of being able to hold a TV or monitor. This is to cater for the growing demand for audio visual equipment on exhibition stands. Flexi-link Kit is a flexible panel which links two Twist banners together. This is what gives the Twist the flexibility it requires to bend and flex round corners. By adding this flexi-link panel you can create a large format exhibition display with seamless graphics. Twist Easi-link Kit enables you to join two Twist banners together to form a rigid display, ideal if you need to cover a back wall or large straight area. It gives you a high impact seamless, back wall display. Flexibility is the number one reason why many professionals in the exhibition industry demand the Twist display system. Whether you are a small business just starting out, or an international company operating on a global scale, the Twist system offers an unprecedented amount of flexibility for your business marketing needs. It has the ability to grow alongside your business and is ideal if are unsure of future exhibition stand sizes requirements. You may begin exhibiting with a single Twist banner stand but you can add more banners and flexi link kits to create a much larger exhibition stand, as and when your budget and business success allows. The possibilities are endless with a Twist system. Configure almost any shape and size stand by linking Twist banners together in the various heights and widths available. Bend and flex your display by adding together a mixture of banners and flexi-link kits. The possibilities are endless with a Twist system – you can create a unique exhibition display that will ensure your brand stands out. The whole Twist system is easily broken down in to smaller manageable pieces and can be store and transported safely and securely in a range of specially designed cases and bags. For a large bespoke exhibition stand you would be far better suited to a wheeled hardcase and wheeled graphics drum, these are specially designed protective cases that will secure your hardware and graphics whilst in storage. The Twist system allows you to transport your exhibition kit easily in the back of your car, or even on the tube across London. Storing and transporting your Twist system couldn’t be easier. Quality assurance – we print and manufacture all our banner stands in-house so we have complete control over the quality and finish of the product. We will only send out a banner stand that has been test-built and quality assured. Price – we regularly review our pricing to ensure it is as competitive as it can be, without compromising on quality. We offer a price promise and will match a competitor’s price on a genuine like-for-like product. Free artwork check – if you upload your own artwork one of our designers will ensure it is in the correct format for the best quality print. We will only print a graphic once we are 100% sure it will provide a high quality finish. We know what we’re doing – we have many years of experience in designing, printing and manufacturing exhibition stands. We use this knowledge and expertise to ensure you get a high quality product that is right for you. No artwork? Don’t worry – we offer a graphic design service and you can work with one of our designers to create a design for your exhibition stand that is right for your business. High quality print and materials – your design will be digitally printed to photo quality standard onto to stoplight media. Each graphic panel is then laminated to give tear, scratch and crease resistance. If you are looking for a bespoke exhibition stand for your next event call our sales team 01733 511030 and we can design a modular Twist exhibition display for you and your exhibition needs. What Are the Best Banner Stands for Exhibitions?